I hope you guys are enjoying hot chocolate week as much as I am. Drinking a nice warm mug of hot chocolate is one of my favorite ways to hide from old man winter. He and I don't get along. We were kind of friends when I was a kid, but we are no longer chums. In fact, I would prefer that we weren't even acquaintances. But alas, I live in the Midwest and as long as that is the case I will have to deal with him. Oh well, at least that means hot chocolate. MiMi made a big pot of white hot chocolate for Christmas last year and it was AMAZING! So, when we got together to make hot chocolate mixes for Christmas gifts this year, we knew there had to be some white hot chocolate mix too! 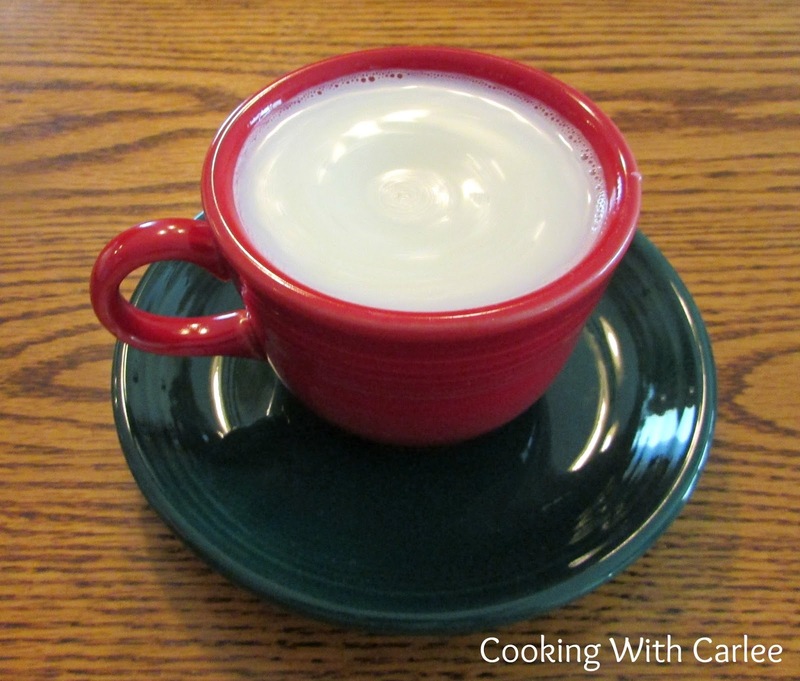 This is a warm creamy mug of yum! You can dress it up with cinnamon, marshmallows or last year MiMi put some Andes peppermint chips and fresh whipped cream on there and it was to die for! I mean really, that is the stuff dreams are made of right there! This is another quick and easy recipe to make. Just like the hot chocolate mix, all it takes is a few minutes in the food processor and you are ready to go. The hardest part is deciding which one to enjoy! I did not realize until today that it was hot chocolate week all week! I love it girl! White chocolate is my absolute favorite so I was so happy to see this! Thank you and I hope you have a terrific and tasty Tuesday! I thought it would be fun to stay on the theme all week! I had so much fun getting everything together for it! Thanks, Andrea! Ohhh this looks delicious! And what a quick and inexpensive gift to pull together for the holidays. Thank you! I would be very happy with some hot chocolate gifts this winter! I love how creamy and decadent white chocolate is! I love hot chocolate mix! For some reason I always crave white hot chocolate around the holidays so this is perfect. I love white chocolate for the holidays too. With a few peppermint chips... mmmm! Hot chocolate sounds so comforting this time of year. It is like a sweet warm hug! Mmm! This sounds so good, Carlee! I also checked out the regular hotx cocoa one, too. The Rudolph jar is so cute. My grands would love making those. I really like them both. I probably like the white chocolate one a bit more because it is different. It's too bad the picture didn't come through. I'll add it to the post when I get a chance. Even if it shows a treat that hasn't been posted yet! I am glad she is liking hot chocolate week! Perfect timing! I set up a hot drink bar in my kitchen and I'm looking for new recipes to try out in my slow cooker. Thanks for the idea! Oooh, yum! What else are you having? You got me at 'simple to make'. :) I don't think I have ever had white hot chocolate but it sounds delicious and I am definitely in the mood for a cup. 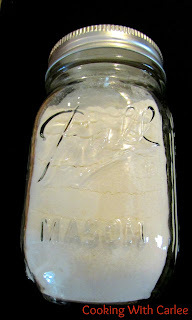 Thanks for sharing MiMi's recipe and for linking up with us at Talented Tuesday. I just love white hot chocolate! Soooo creamy and yummy! 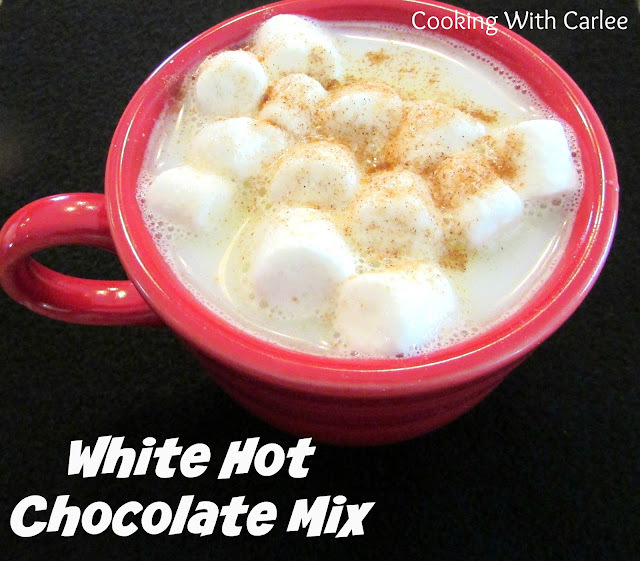 Your homemade White Hot Chocolate Mix looks awesome! Thank you so much for sharing with Full Plate Thursday and have a great day. This is awesome! Thanks for linking up with What's Cookin' Wednesday! These are perfect to go with your snow men Marshmallows or the cinnamon honey ones too!! Thanks for sharing on My 2 Favorite Things on Thursday! Hope to see you again! Pinned! It was a lot of fun to do a whole week of hot chocolate themed posts! I love white chocolate and will definitely have to try your recipe! Thanks so much for linking it up at Share The Wealth Sunday and I hope you'll join us tonight for an all new party! I love white chocolate too and it works so well in hot chocolate! See you at the party! Thanks for this recipe.Just found some milk bottles with red lids today, and thought they'd be great to fill with a white hot chocolate mix as xmas gifts....can the amount of both sugars be reduced without compromising the recipe? I can't see why not. In fact, I might give that a try myself next time I make a batch. That will be so cute in milk bottles with red lids. How fun! It makes around 12-16 depending on how generous you are. I'm going to pick up some of the ingredients that I don't have on hand. I will make up a batch this afternoon so it will be ready for me this evening when I curl up on the couch. I can hardly wait. �� Thanks for sharing.